Below is a partial listing of organizations, groups, clubs, publications and scanner related web sites that make up an integral part of the "scanning scene". Some offer a "local flavor" while others promote interest for those hobbyist throughout the USA. As of March 2014, Joe Cardani has closed the Phillyscanner website. Pages of his Philly Guide Book are available by visiting the Philly Scanner Yahoo Group. Joe Cardani has been a fixture in the Philadelphia scanning scene for close to two decades now. His enthusiastic attitude, diligent work and hours of research have been developed into the most comprehensive frequency guide for the extended Philadelphia region. The Philadelphia Area Communication Guide is a "must-have" for those living and working in the region. 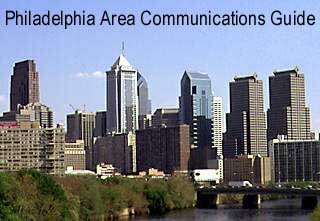 He has also headed up the PhillyScanner Yahoo group where area buffs can post and comment on various scanner related topics covering the greater Philadelphia metro area. Over the years Lindsay C. Blanton III has developed what has been considered the best radio scanner web site. It sports an up-to-date database which has been put together by hundreds of loyal hobbyists across the USA. A full-featured forum section allows many scanner buffs to share ideas and questions regarding the hobby. This is the ultimate scanner site that offers hobbyists the most resources for the enhancement of the hobby. General access to their database, forums and the Wiki are FREE! There is however some additional services offered for premium subscribers that allow numerous programming applications to access the database directly to aid in the process of programming scanners and communication equipment. Beginers as well as seasoned veterans frequent his site daily. Be sure to bookmark this page! Headed up by Alan Henney, the Capitol Hill Monitors web site is the one-stop source for scanner related information for the Washington D.C., Northern Virginia, Maryland (Baltimore metro) area including the southern Delmarva penisula. Alan also produces the CHM Newsletter. Archived newsletters are available via download. Alan also provides a Visitor's Scanning Guide for the Washington D.C. area that is incorporated within the pages of the January 2005 issue. Probably one of the most dynamic monitoring sites in the U.S.A. Billed as America's #1 Scanning, CB and Two-way radio Magazine. National Communications is produced by the industry's leading writers. Names like Chuck Gysi to Laura Quarantiello, to Jim Sutton, to our product reviewer Tom Swisher, CB specialist John Phillips or mod man Mike Castagna all contribute to make this the number one magazine for the radio crowd. Editing by the Bearcat Radio Club (America's largest scanner club) and National Citizen's Band Center, (America's largest CB club) ensures NatComm readers of top notch material and the latest information for the radio hobby. Information on subscriptions are available by visiting their site. As of the DECEMBER 2013 issue, Monitoring Times Magazine stopped publication. Monitoring Times magazine contains features on shortwave broadcasting, scanner listening, military, maritime, and aviation monitoring, and receiver reviews. Probably the "daddy" of all publications, Bob Grove has worked throughout the years to cultivate the best writers around to bring hobbyists the best in the monitoring information. Monitoring Times comes in two formats: the printed magazine, and the same magazine in Adobe Acrobat PDF (with full color and active links to URLs and email addresses). Way to go Bob! Starting with CQ's February 2014 issue, content from Popular Communications, CQ VHF and WRO, will be merged into a new expanded digital edition of CQ. New publication name is CQ Plus. 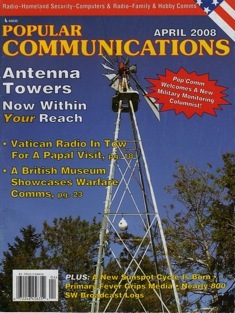 Popular Communications is a magazine with content relating to the radio hobby, including scanners, shortwave radio, CB, and amateur radio. The magazine includes articles, schedules of shortwave stations, and logs of pirate radio communications sent in by readers. Contact them for more information on subscriptions. be found on the www.amateurradio.tv website. The monthly newsletter has been suspended. Anybody can join the NYDXA-List by sending an email to our nydxa@yahoo.com address. We attempt to concentrate on the radio issues of the NYC metro area for any frequency from "DC to Light", except amateur radio of course. We'll talk about the upcoming digital TV switch, new UHF trunking systems for NYC, IBOC, DRM, satellite radio (XM/Sirius), satellite TV, SWBC, AMBCB, utilities, etc. AS OF LATE 2013, AOSC's The American Scannergram has merged with the Scanner Digest Newsletter. The primary activity, and reason for being, of the AOSC is it's newsletter. The newsletter is an information exchange providing members with a common means of sharing information and resources which are vital to the continued enjoyment of the radio listening hobby. The American Scannergram is the platform where excellent scanner information can be found. No other publication has the loyalty and saturation of its readers than does the American Scannergram. Dave Marshall has recruited a unique group of writers who cover topics in local areas as well as an excellent Federal Government/Military column and periodically includes some great product reviews. This would be under MARINE scanning. It allows locating and tracking AIS active entities and locating geographical points reference to marine broadcasts and reported distresses. The upper right corner of the display lists the lat/long of the pointer. The Filter (second icon on left of screen) allows one to select the entities of choice to display.